This book is a companion text to Active Control of Sound by P.A. Nelson and S.J. Elliott, also published by Academic Press. 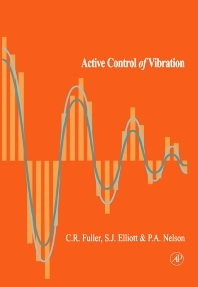 It summarizes the principles underlying active vibration control and its practical applications by combining material from vibrations, mechanics, signal processing, acoustics, and control theory. The emphasis of the book is on the active control of waves in structures, the active isolation of vibrations, the use of distributed strain actuators and sensors, and the active control of structurally radiated sound. The feedforward control of deterministic disturbances, the active control of structural waves and the active isolation of vibrations are covered in detail, as well as the more conventional work on modal feedback. The principles of the transducers used as actuateors and sensors for such control strategies are also given an in-depth description. The reader will find particularly interesting the two chapters on the active control of sound radiation from structures: active structural acoustic control. The reason for controlling high frequency vibration is often to prevent sound radiation, and the principles and practical application of such techniques are presented here for both plates and cylinders. The volume is written in textbook style and is aimed at students, practicing engineers, and researchers. Introduction to Mechanical Vibrations: Terminology. Single-degree-of-freedom (SDOF) Systems. Free Motion of SDOF Systems. Damped Motion of SDOF Systems. Forced Response of SDOF Systems. Transient Response of SDOF Systems.Multi-degree-of-freedom (MDOF) Systems. Free Motion of MDOF Systems. Forced Response of MDOF Systems. Damped Motion of MDOF Systems. Finite Element Analysis of Vibrating Mechanical Systems. Introduction to Waves in Structures: Longitudinal Waves. Flexural Waves. Flexural Response of an Infinite Beam to an Oscillating Point Force. Flexural Wave Power Flow. Flexural Response of an Infinite Thin Beam to an Oscillating Line Moment. Free Flexural Motion of Finite Thin Beams. Response of a Finite Thin Beam to an Arbitrary Oscillating Force Distribution. Vibration of Thin Plates. Free Vibration of Thin Plates. Response of a Thin Rectangular Simply Supported Plate to an Arbitrary Oscillating Force Distribution. Vibration of Infinite Thin Cylinders. Free Vibration of Finite Thin Cylinders. Harmonic Forced Vibration of Infinite Thin Cylinders. Feedback Control: Single-channel Feedback Control. Stability of a Single-Channel System. Modification of the Response of an SDOF System. The Effect of Delays inthe Feedback Loop. The State Variable Approach. Example of a Two-degree-of-freedom System. Output Feedback and State Feedback. State Estimation and Observers. Optimal Control. Modal Control. Feedforward Control: Single Channel Feedforward Control. The Effect of Measurement Noise. Adaptive Digital Controllers. Multichannel Feedforward Control. Adaptive Frequency Domain Controllers. Adaptive Time Domain Controllers. Equivalent Feedback Controller Interpretation. Distributed Transducers for Active Control of Vibration. Active Control of Vibration in Structures: Feedforward Control of Finite Structures. Feedback Control of Finite Structures. Feedforward Control of Wave Transmission. Actuator Arrays for Control of Flexural Waves. Sensor Arrays for Control of Flexural Waves. Feedforward Control of Flexural Waves. Feedback Control of Flexural Waves. Active Isolation of Vibrations: Isolation of Periodic Vibrations of an SDOF System. Vibration Isolation From a Flexible Receiver; the Effects ofSecondary Force Location. Active Isolation of Periodic Vibrations Using Multiple Secondary Force Inputs. Finite Element Analysis of an Active System for the Isolation of Periodic Vibrations. Practical Examples of Multi-Channel Feedforward Control for theIsolation of Periodic Vibrations. Isolation of Unpredictable Vibrations from a Receiving Structure. Isolation of Vibrating Systems from Random External Excitation; the Possibilities for Feedforward Control. Isolation of Vibrating Systems from Random External Excitation; Analysis of Feedback Control Strategies. Isolation of Vibrating Systems from Random External Excitation; Formulation in Terms of Modern Control Theory. Active Isolation of Vehicle Vibrations from Road and Track Irregularities. Active Structural Acoustic Control, I. Plate Systems: Sound Radiation by Planar Vibrating Surfaces; the Rayleigh Integral. The Calculation of Radiated Sound Fields by Using Wavenumber Fourier Transforms. Sound Power Radiation From Structures in Terms of TheirMulti-Modal Response. General Analysis of Active Structural Acoustic Control (ASAC) for Plate Systems. Active Control of Sound Transmission Through a Rectangular Plate Using Point Force Actuators. Active Control of Structurally Radiated Sound Using Multiple Piezoelectric Actuator; Interpretation of Behaviour in Terms of the Spatial Wavenumber Spectrum. The Use of Piezoelectric Distributed Structural Error Sensors in ASAC. An Example of the Implementation of Feedforward ASAC. Feeback Control of Sound Radiation From a Vibrating Baffled Piston. Feedback Control of Sound Radiation From Distributed Elastic Structures. Active Structural Acoustic Control, II. Cylinder Systems: Coupled Cylinder Acoustic Fields. Response of an Infinite Cylinder to a HarmonicForcing Function. Active Control of Cylinder Interior Acoustic Fields Using Point Forces. Active Control of Vibration and Acoustic Transmission in Fluid-Filled Piping Systems. Active Control of Sound Radiation From Vibrating Cylinders. Active Control ofSound in Finite Cylinder Systems. Control of Interior Noise in a Full Scale Jet Aircraft Fuselage. Appendix. References. Index. U.S. Geological Survey, Menlo Park, California, U.S.A.
P.A. Nelson is Professor of Acoustics.